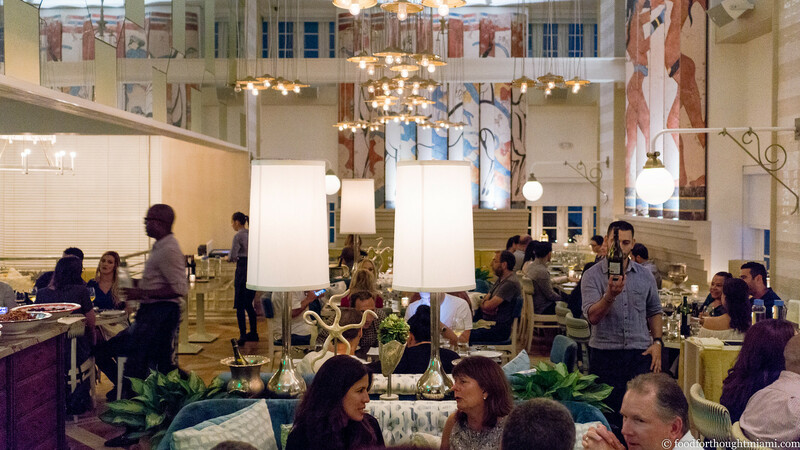 I've been meaning for some time to write about Byblos, a new-ish restaurant on South Beach in the old Shorecrest Hotel. 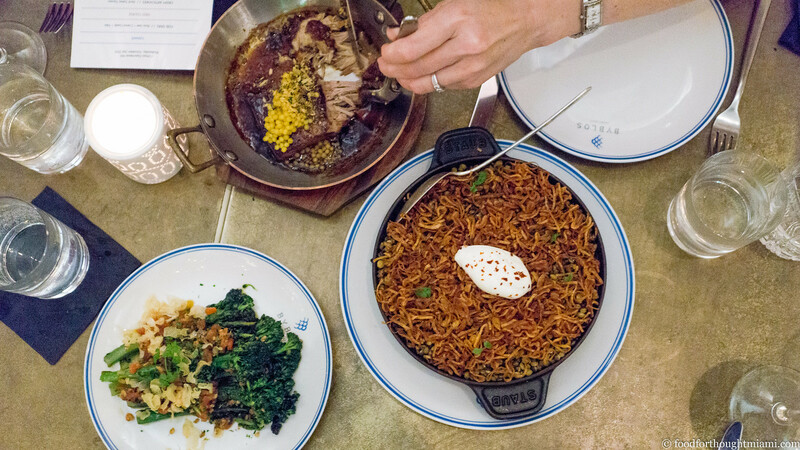 A more expansive review will be forthcoming at some point, but the short version is this: despite my general aversion to South Beach hotel restaurants, especially those by big out-of-town restaurant groups, I think Byblos is putting out really flavorful, contemporary Middle Eastern food in a beautiful space and providing excellent service. Even shorter: I really like it. 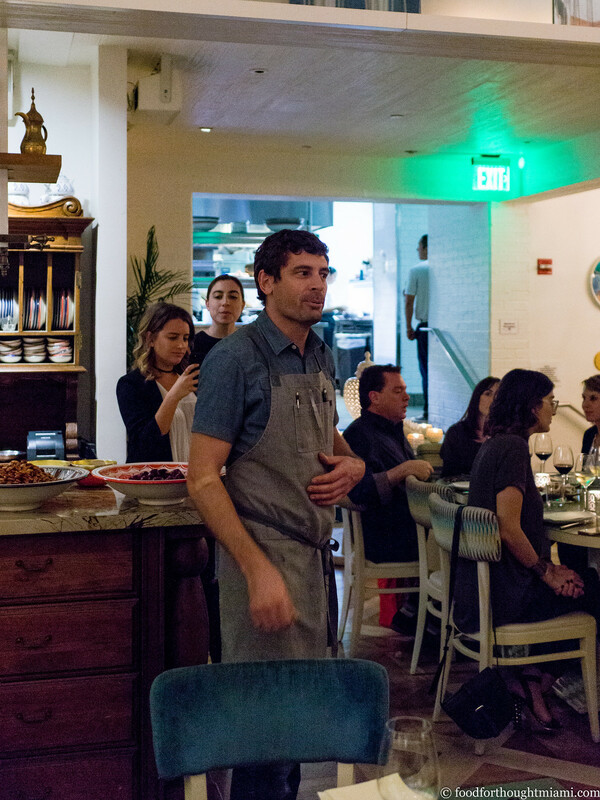 In the meantime, here's a recap of the Cobaya dinner we held there last week with Chef Stuart Cameron, who came down from Toronto to cook for fifty of us guinea pigs who took over the upstairs dining room. I thought he and his crew did a very good job of going off-menu while still capturing the spirit of the place. (You can see all my pictures in this Cobaya Byblos wtih Chef Stuart Cameron flickr set). 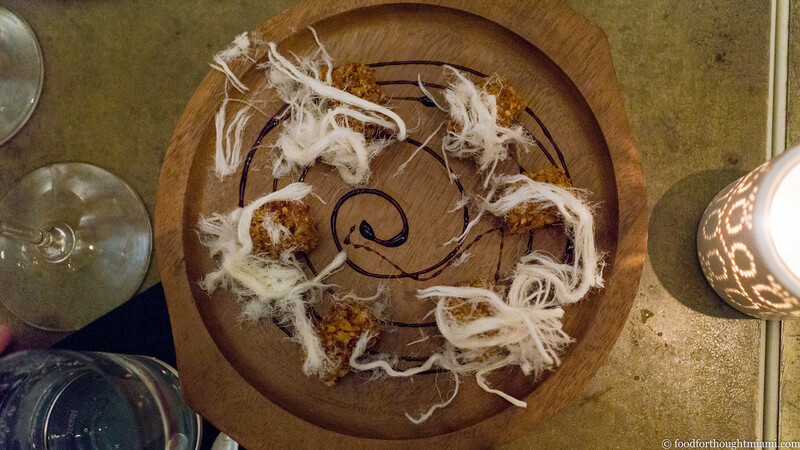 For a first bite, foie gras bonbons, rolled in nuts, drizzled with rose jam, and wrapped loosely in pashmak, a Persian sesame and sugar flavored cotton candy. For another little snack, a bowl of crisp-fried slivered baby artichokes, paired with an herb-infused tahini tarator sauce. 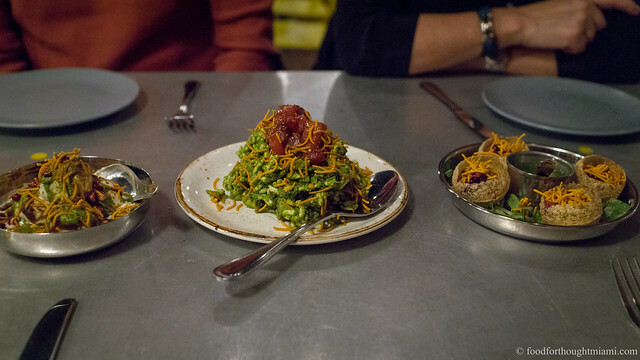 A round of raw dishes inspired by Lebanese kibbeh nayeh followed. The salmon nayeh featured diced pink salmon swimming in a jalapeño dressing, the spice level amped up even further by a green schug (a Yemenite chile paste). 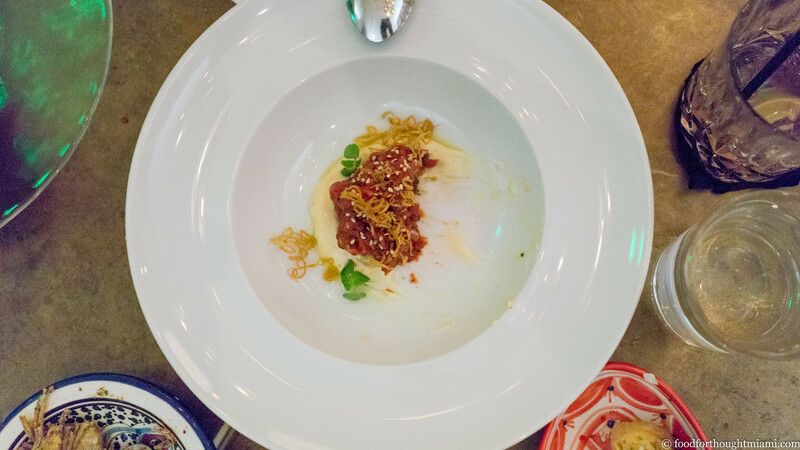 Even better was the grass-fed steak tartare, enriched with a silky argan oil aioli, warmed with Fresno chile peppers, brightened with dried mint, and given some textural contrast with a shower of crispy shallots. It was excellent. I like that Cameron does not shy away from spicy and bold flavors, while still keeping them in balance. 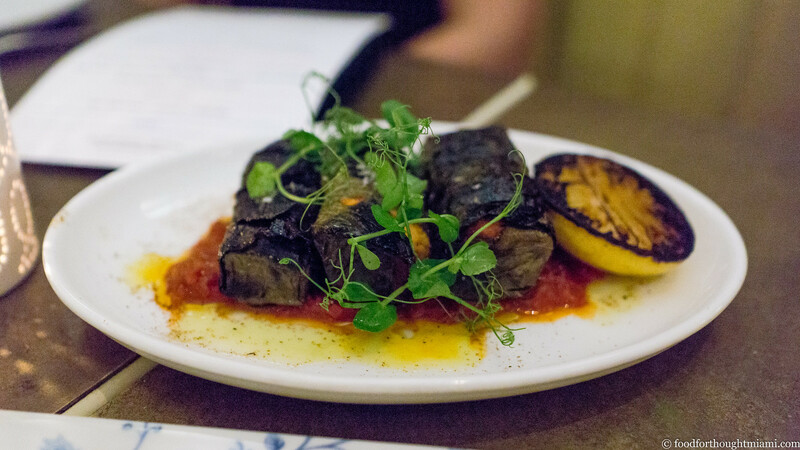 The next round of dishes started with planks of swordfish, wrapped in crispy charred vine leaves, served over a spicy tomato and horseradish chraine sauce dusted with Persian lime powder. 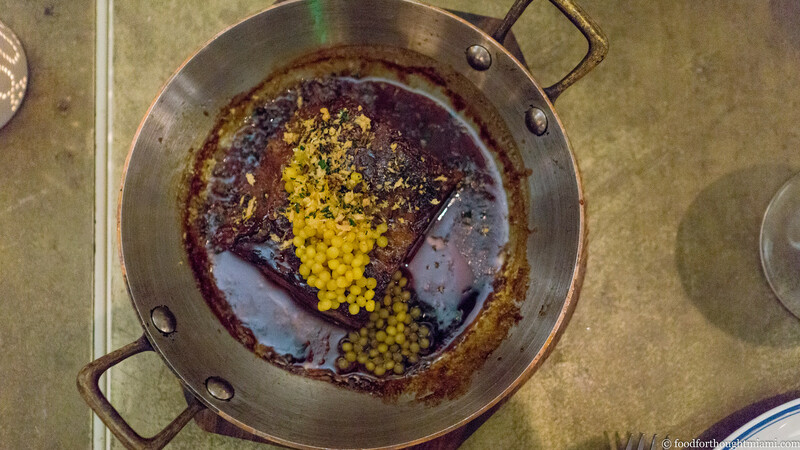 I loved the contrast of textures, the brightness of the sauce, and the way the Persian lime brought everything into focus, like you just started eating in HD. 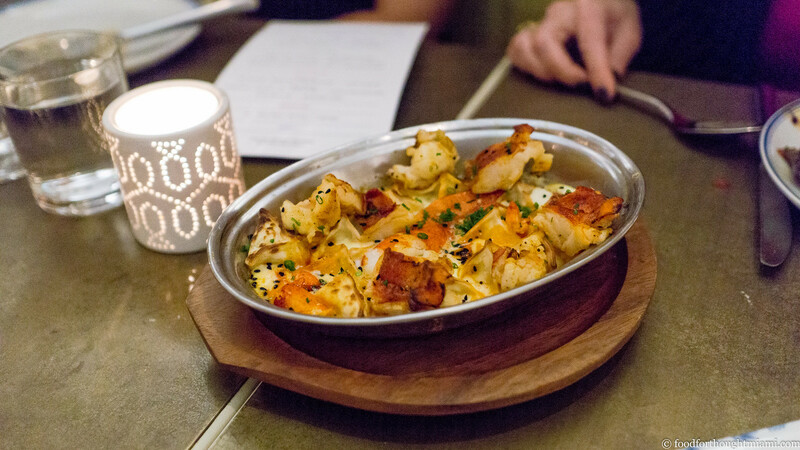 The eggplant-filled manti are one of my favorite items on the regular menu at Byblos; here was a luxe version, the pillowy dumplings snuggling with sweet, tender lobster, dressed in both a creamy yogurt sauce and a warming paprika butter. 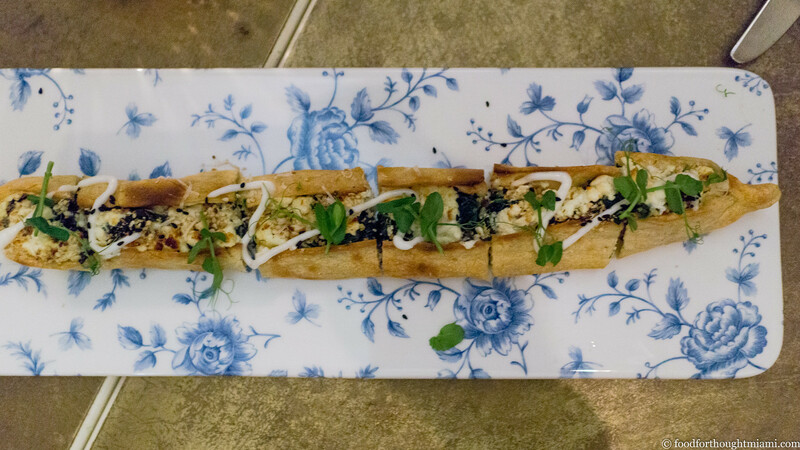 The creamed spinach pide (a long flatbread) snuck its way in from the regular menu, but I didn't resent its presence: crusty chewy bread, topped with creamy spinach, tangy feta cheese, garlicky toum and a sprinkle of dukkah spice. The braised veal breast was very good, the tender, almost wobbly meat reminiscent of grandma's brisket, the sticky sauce of reduced meat juices and preserved lemon probably more intriguing than anything grandma cooked. 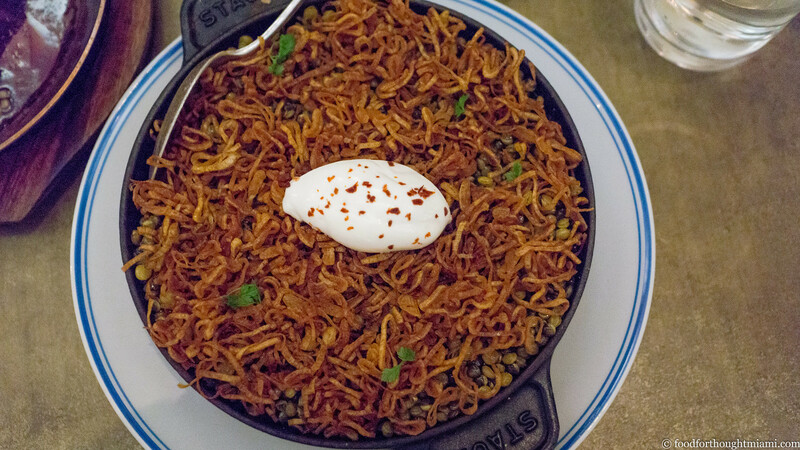 But the real winner for me was the mejadra, a traditional Middle Eastern combination of rice, lentils and fried onions, done here with fancy French lentils and a blanket of delightfully crisp and sweet fried shallots. At this point I was too full to eat as much of this as I wanted to, and I envied the savvy of those folks who packed some up to take home. 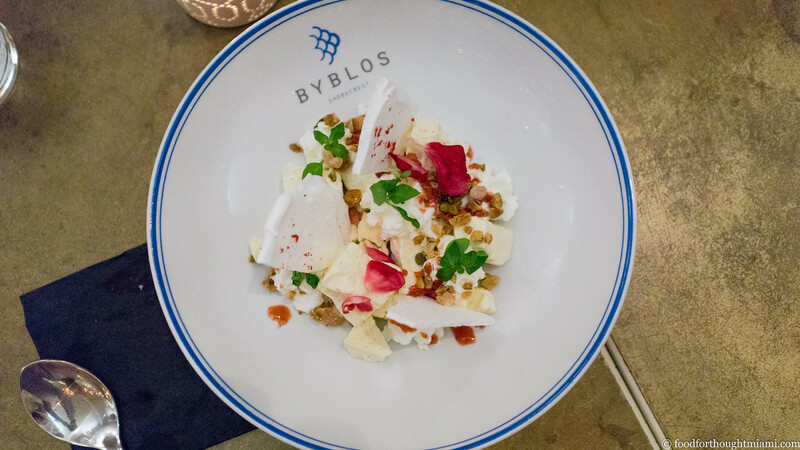 I like how they do desserts at Byblos: they're bright, light, colorful and fun. The "Middle-Eton Mess" was a particularly clever mash-up of traditional British dessert and Middle Eastern flavors: halva parfait, rose-flavored crispy meringue, creamy yogurt, sumac and strawberry granita, and a sprinkling of ajeel crumbs (which I've seeen smartly described as "Persian trail mix"). 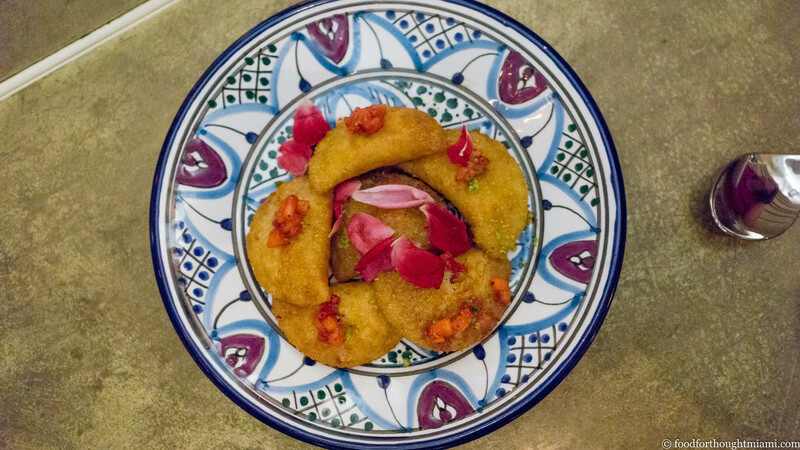 In the same spirit were the crisp-shelled qatayef filled with strawberry cheesecake, drizzled with honey and topped with crumbled pistachios – kind of like a refined Middle Eastern version of a McDonald's apple pie. 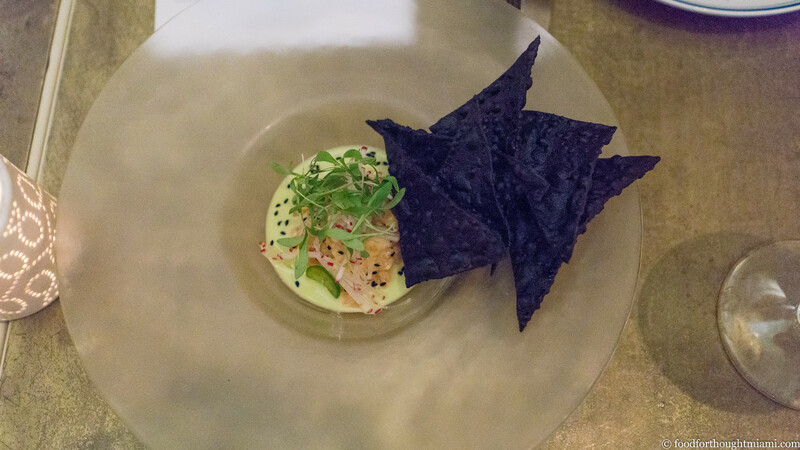 A big thank you to Chef Stuart Cameron, to all of his team at Byblos, to Kimberly Nolan and Alexandra Fulton for all their help in putting together this dinner, and as always most of all, to the guinea pigs whose interest and support make these events possible. sitting shiva and eating P.I.G.